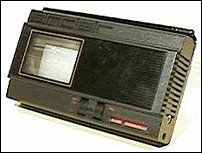 The TV80 pocket television, also known as the Flat Screen TV (FTV), was the fruit of an obsession which Clive Sinclair had held for more than 20 years. As early as 1963, near the very start of his career as an inventor of electronics, he had sought to create a handheld television set. His earlier attempts resulted in the Microvision (1966 - launched but never actually sold) and TV1A/B/C/D (1976-78 - four models for the US, UK and continental European markets). The spectacularly successful Sinclair computers had been produced with the primary objective of raising capital for other, "innovative" projects such as the pocket TV and C5. With the money rolling in from Spectrum sales, Sinclair was now able to realise his dream of producing a slimline flat-screen pocket TV which (unlike his earlier attempts) did not use a conventional, power-hungry cathode-ray tube. Instead, the electron beam creating the TV80's picture was produced by a specially designed CRT set in the side rather than the back of the television, being deflected through a right angle by a strong electric field to hit the phosphor screen. It proved far from straightforward to develop a suitable package within which to incorporate the tube. Sinclair's design team went through numerous prototypes for what was originally to be called the Microvision 2700. Some of these still exist in the Brighton-based International Vintage Electronics Museum and show vividly how - in marked contrast to the much more rigid design constraints of the ZX Spectrum - a wide range of different ideas was tried. One proposal featured a folding clamshell, rather like that of the Psion organisers or Hewlett-Packard's Jornada. Another utilised a shallow V-shape, evidently designed to be grippable (but probably abandoned for being neither truly pocketable nor capable of easy use on a tabletop). The designs eventually converged on the version eventually selected, which was about the size of a paperback book. The TV80 was not a great success and did not recoup the £4m Sinclair had invested in its development. (The name refers to its £80 selling price; the set was often marketed as the "Flat Screen Television" or FTV.) It was difficult and expensive to produce, and had an extremely narrow viewing angle. Only about 15,000 were sold. And obsolescence was already on the horizon: New Scientist warned prophetically that the TV80's ingenious technology would be short-lived, in view of the liquid crystal display technology being developed by Casio and other Japanese electronics firms. Today, every pocket TV on the market uses LCDs and the cathode ray tube itself - a technology little changed since its invention in the early twentieth century - is under threat from flatscreen plasma and LCD displays.